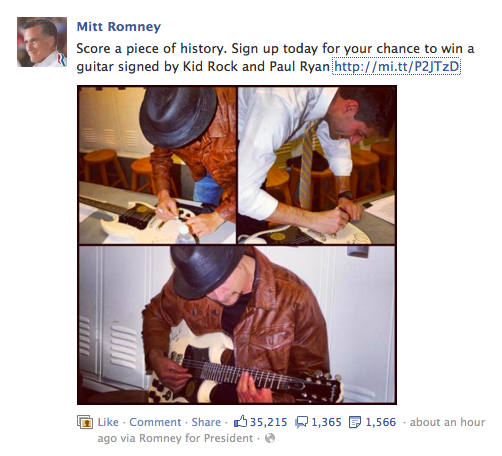 The Romney/Ryan presidential campaign marketing team is giving away a guitar signed by Kid Rock and Paul Ryan. Obama/Biden’s strong presence in pop-culture demands that the Romney/Ryan team step it up, if they want to win this election. Despite all the criticism, Obama is appearing on popular talk shows and making appearances with celebrities. Obama probably knows he can’t win the popular vote without being in front of the right audience. Unfortunately, a lot of the potential voters are not paying particular close attention to the issues of the United States or our freedoms that are currently under attack. Instead they are watching daytime talk shows, soap operas, listening to their I-pod playlists, etc. 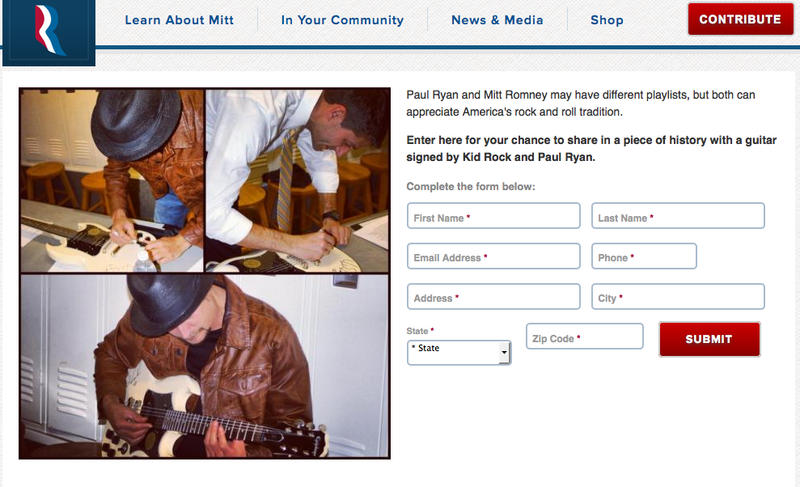 For the first time, that I have noticed, the Romney Ryan campaign is jumping on the bandwagon and making efforts to get involved with pop-culture. My personal taste in music says that aligning with Kid Rock is a bad idea. But with 1,566 re-shares on Facebook all within an hour of Mitt Romney posting the giveaway, the numbers say that this is going to be a huge success! See giveaway page here. Both parties seem to have figured out branding. The more impressions you get the higher the chance of people picking your brand. In this case it’s a presidential brand, but the rules still apply.